Season 1878/79 opened with the Queen’s Park Sports. The preliminary ties for the 4-a-side football tournament took place on Saturday 31 August. The main event on the following Saturday attracted 5,000 spectators to Hampden Park and passed off very successfully. The pitch was described as being as smooth as a bowling green. The Queen’s Park Second Eleven had been functioning successfully for six years and the club decided to start a third team – the Queen’s Park Hampden Eleven. Like the second team, the Hampden Eleven would often play other clubs’ first elevens and they made their debut on Saturday 14 September, losing 1-0 to Wellpark at Hampden Park. On Saturday 21 September, the Second Eleven continued their series of matches against English opposition when Stoke visited Hampden Park. Queen’s won 4-1, with goals from T F Smith, D Brand and E Fraser. The other goal came when A Peden and J G Crichton both connected with the ball at the same time. The Stoke players showed good individual skill but the traditional English failure to play as a team cost them dear. Immediately following the Stoke game, the Queen’s Park first eleven took to the field at Hampden Park to face Kelvinbank in the first round of the Scottish Cup. Queen’s recorded a very comfortable 8-0 victory. Queen’s were five up at the interval through Jimmy Weir (2), Charles Campbell and James Richmond (2). In the second half, Weir got his hat trick and George Ker and Harry McNeil took the total to eight. On the following Saturday, Queen’s Park met their great rivals Vale of Leven at Hampden Park. Vale won 1-0 before 10,000 spectators, with a goal from McPherson. Queen’s thought they had equalised when a Harry McNeil shot appeared to have gone clear under the bar before being punted clear. The umpires failed to agree and the decision was left to the referee, Mr Harkness of Rangers, who gave no goal. The Glasgow Herald report of the match referred to the new and handsome club house at Hampden Park. The second elevens drew 1-0 in Alexandria, with Peden scoring for Queen’s. On Saturday 5 October, Queen’s Park beat 3rd Lanark Rifle Volunteers 3-2 before around 3,500 spectators at Hampden Park. It was 0-0 at half-time. Fifteen minutes into the second half, Queen’s took the lead through Jimmy Weir. Robert Fraser doubled the lead and Queen’s went three up when a Volunteers defender deflected a Charles Thomson corner through his own goal. The Cathkin men pulled one back from a scramble in front of goal, with Queen’s claiming hand ball, and McAdam got a second for the Volunteers with a powerful shot a few minutes from time. The first meeting of Rangers and Queen’s Park for over a year attracted a crowd of around 2,500 to Kinning Park on the following Saturday. Queen’s took the lead in 15 minutes through Harry McNeil. Rangers pressed hard in the final 15 minutes of the game but it finished 1-0. On Saturday 19 October, Queen’s Park beat Pollokshields Athletic, a former rugby club, 6-0 at Hampden Park in the second round of the Scottish Cup. Queen’s were three up at half-time through James Richmond (2), and Harry McNeil. The second half scorers are not known. Queen’s Park were keen to introduce the Association game to as wide an audience as possible and, on Thursday 24 October 1878, Queen’s and Caledonian played an exhibition match at the Ulster Cricket Ground in Belfast. There was great interest in the match and a large number of spectators attended. The result was recorded as a 3-1 victory for Queen’s Park but, in actual fact, the teams were a mixture of players from both sides. 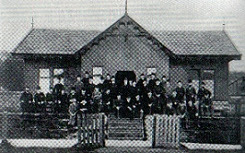 Two days later, Queen’s Park welcomed the Ayrshire Association to Hampden Park. Despite losing 7-1, the Ayrshire team, composed of players from the Ayrshire clubs, were considered to have done remarkably well given that they had never played together before. Queen’s took the lead through Andrew Peden in four minutes and scored a second four minutes later. Ayrshire pulled one back but goals from Walter Lamberton, George Ker, Harry McNeil and Tom Highet put Queen’s 6-1 up at half-time. Ker got the only goal of the second half. On Saturday 2 November, Queen’s Park beat Mauchline 6-1 at Hampden Park with goals from Robert Fraser, George Ker (2), Harry McNeil, David Davidson and Willie Mackinnon. Queen’s Park’s next fixture was the club’s first ever floodlit game. At a meeting of the Glasgow Charity Football Committee, letters had been read from Vale of Leven, Queen’s Park, 3rd Lanark Rifle Volunteers and Rangers agreeing to play matches for charity under the electric light. Rangers and 3rd LRV were the first to play under the light on Monday 4 November. Around 7,500 spectators turned up at Hampden Park for the match. Three lights were used but the non-arrival of proper reflectors from London meant that there was insufficient light at times over the ground. Two days later, Queen’s Park and Vale of Leven met under the lights for their tie. The three lights were more effective than on the Monday evening but there were still black streaks that the lights failed to illuminate and, when the ball was kicked in the air, the players had to wait until it reached the ground before they could see it. Queen’s Park won the game 2-0. Tom Highet scored the first goal, with the second coming from a long shot by one of the Queen’s forwards. The general view was that the electric light experiment had been a disappointing failure. On Saturday 9 November 1878, Queen’s Park met Notts County at Hampden Park in the latest in the annual meetings of the clubs. Poor weather affected the attendance, although there was still a fair turnout of spectators. Queen’s won 4-0, with goals from Harry McNeil, Tom Highet, Walter Lamberton and Jimmy Weir. After dinner in the Athole Arms Hotel, the Notts players left Glasgow on the 9.15pm train. On the following Saturday, Queen’s Park made the short trip to Cathkin Park to take on 3rd Lanark Rifle Volunteers. The crowd of over 2,000 witnessed a fine no-score draw. Queen’s hit the bar in the first half and besieged the Volunteers’ goal in the second. Thirds finished with nine men, Hunter and Lang having retired hurt. On Saturday 23 November, Queen’s Park beat Lennox 4-0 at Hampden Park, with goals from Geordie Ker, Harry McNeil and Tom Highet (2). One report gave the score as 5-0. This probably relates to the fact that James Richmond thought he had scored on the stroke of half-time but time had been called just before the ball crossed the line. Queen’s Park were back on Scottish Cup duty on Saturday 30 November, after having received a bye in the third round. Mauchline were the visitors to Hampden Park. Queen’s were one up at the interval from a free kick (scorer unknown). Four more goals followed in a one-sided second half. The scorers were Tom Highet, George Ker, Jimmy Weir and Willie Mackinnon. On Saturday 7 December 1878, Queen’s Park were scheduled to play Vale of Leven in Alexandria but called off the game by telegram due to their inability to muster a team owing to the state of the ground. The announcement caused great disappointment, and probably annoyance, in Alexandria. No football was played in Scotland on Saturdays 16 and 23 December and Queen’s Park did not return to action until Wednesday 1 January 1879. Queen’s and Caledonian played a match at Hampden Park in aid of the Unemployed Fund. An under strength Queen’s Park won 6-1. A total of £6 13s was drawn at the gate and the entire sum was handed to the fund. The First Eleven did not play again in January but the Second Eleven travelled south to take on the first teams of Stoke and Aston Villa. On Saturday 18 January, the Second Eleven met Stoke. The Potteries club had moved to a new ground since Queen’s previous visit, having secured the ground of Stoke Victoria Athletic Club. The field was described as first-class but, unfortunately, the match was played in a snowstorm and the pitch was covered in four or five inches of snow. Queen’s won 4-1. Three of the goals were scored by Brand, MacTavish and Smith. The other goal was scored by Eadie Fraser or Robert Fraser, or might even have been an own goal. Following their success at Stoke, the Second Eleven moved on to Birmingham two days later to take on Aston Villa at Wellington Road, Perry Barr “before a large attendance”. Queen’s lost Eadie Fraser early in the game and Villa allowed his place to be taken by Day of Stoke. They may have had some cause to regret this generous concession when the visitors came back from a goal down to win the match. Villa took the lead through Hughes after half an hour. The Birmingham Daily Post reported that Queen’s had been unlucky to be behind but fought back. Andrew Brand hit the equaliser and the winner came after non-stop Queen’s pressure. The scorer is not known. On Saturday 1 February, it was the turn of the Queen’s Park senior side to make the rail journey south. Their opponents were old rivals Notts County. The day was extremely cold, with a biting east wind, and only about 400 spectators were present. The Trent Bridge pitch was covered with frozen snow and good play was well nigh impossible. Queen’s did not field their strongest eleven but still won 2-0. The first goal came from a scrimmage in 15 minutes. According to the Nottinghamshire Guardian, Harry McNeil hit the ball into the goalmouth “whence the Scotchmen with a determined rush sent it through the posts”. Queen’s second goal came five minutes before half-time through P Clifford, after clever passing between David Davidson, George Ker and Harry McNeil. Trial matches for representative games were given a measure of prominence in the 1870s and, on Saturday 15 February, Queen’s Park players took part in the trial match for the upcoming Glasgow versus Sheffield clash. The match itself took place at Hampden Park on the following Saturday. Glasgow won 4-1. The scorers were James Richmond (2), Harry McNeil and George Ker, all of Queen’s Park. On Saturday 22 February, there was an International Trial Match at Cathkin Park. Scotland should have travelled south to take on England on Saturday 1 March but the match was called off due to bad weather. The Queen’s Park senior eleven played their third match of the year on Saturday 1 March 1879. Their opponents were Caledonian. Queen’s won 6-0 at Burnbank with goals from Geordie Ker (3), John Graham (2) and James Richmond. Despite the pitch being in dreadful condition, there was some fine play by both sides. Two weeks later, on Saturday 22 March, Queen’s Park and Rangers met at Hampden Park in the sixth round or quarter-final of the Scottish Cup. A crowd of 10,000 was present to see Queen’s go down to a shock 1-0 defeat. Queen’s Park had the benefit of a strong breeze in the first half but the Rangers defence managed to hold out. The position was reversed in the second half, with Rangers doing the bulk of the attacking. With five minutes to go, Rangers made the breakthrough. Vallance shot for goal and a cluster of four Rangers players forced goalkeeper William Thomson and the ball through the goal. William Dunlop was credited with the final touch. Queen’s claimed hand ball but to no avail. It was a disappointing Queen’s Park performance, and somewhat unexpectedly, it was Rangers who progressed. Queen’s Park bounced back from their Scottish Cup disappointment on the following Saturday with a 5-0 victory over Beith at Netherhill Field. Following trial matches on the previous two Tuesdays, Scotland travelled to London’s Kennington Oval on Saturday 5 April to face England. William Somers, Charles Campbell, Willie Mackinnon and Harry McNeil were part of the Scotland side that lost 5-4. Willie Mackinnon scored twice in the match. On Monday 7 April, David Davidson and Harry McNeil played in Scotland’s 3-0 victory over Wales in Wrexham. On Saturday 12 April, Queen’s Park headed south once more to take on Manchester Association Wanderers. The Wanderers had been formed after Queen’s Park had beaten Birch in the previous year to “present the Association game”. The match was played at Whalley Range, the home of Manchester Rugby Football Club. Queen’s won 4-0, with goals from David Davidson, Eadie Fraser (2) and George Ker. Two weeks later, on Saturday 26 April, Glasgow University were visitors to Hampden Park. Both teams were under strength in a match won 2-0 by Queen’s Park before a crowd of about 1,500. Harry McNeil scored the first goal and the second came from a scrimmage. Former 3rd LRV players William Somers and A M Buchanan, goalkeeper, turned out for Queen’s Park. On the first Saturday in May, Charles Campbell, T F Smith and George Ker were part of a Queen’s Park, Bolton and Manchester Wanderers select side that played a Darwen and Blackburn select before a crowd of 3,000 at Turton Moor in Bolton. Although the game finished 0-0, it was described as “one of the finest matches ever played in the district”. Queen’s Park played their last, and probably their worst, game of the season on Saturday 10 May 1879. The occasion was a Charity Cup first round match played at the Agricultural Showyard in Glasgow Green and the opponents were old rivals Vale of Leven. A crowd of 8,000 saw Queen’s lose 4-0, the club’s heaviest-ever defeat. The game was very rough and Queen’s lost ‘keeper Buchanan with a head wound in the first half, with centre forward Willie Mackinnon taking over in goal. None of the Queen’s men played to form. At the end of the match, the Lord Provost thanked the players for their efforts and said that about £300 had been raised for the Unemployed Fund. Although the season was officially over, on Wednesday 26 June a match took place between Kirkintilloch Athletic and a Glasgow Select. It was reported that the Glasgow Select, who won 3-1, consisted of well-known Queen’s Park players.